Your client asks for a snapshot of your project's progress and wants to see the budget status right away! 🙈 Back when you were tracking time manually this was enough to give you a case of the 💦 sweats. With Timely, you can quickly get all the information you need to send your client down Easy Street. Whether you freelance or manage a team, it's important to know a project's health at every stage. Understanding performance also reveals the insights you need to plan future projects more accurately. Timely provides you with the essential project stats needed to stay on-budget, quickly update stakeholders and allocate team resources effectively. Every project in Timely has a dedicated page. Access it simply by clicking on the project's name – either from a pinned Project card or from the ‘All Projects’ page. You'll land on a page with the Project and Client name, front and center. Clicking the ‘…’ in the upper right-hand corner will give you the option to Pin, Open in Reports, Archive or Delete the project. View archived projects in the “All Projects” tab on the Projects home page. Note: Deleting a project from Timely means it will be gone…forever. Now, let’s take a look at what each tab offers! This section is designed to give you a breakdown of the budget progress across the project's lifetime. You can quickly track budget stage, see how many hours have been spent on the project, and compare planned money against the total remaining budget. It's especially helpful when you’re nearing the end of a project and need to stick to a tight budget! If you’re looking to make edits on the project (e.g. updating your budget or adjusting user hourly rates), click the ‘Edit Project’ button on the top right-hand side of the screen to be redirected to the Edit Project page. This one's only for people on the Company plan. If you've set your Project to have a recurring budget, you'll find your monthly or weekly budget status here. The Budget tab helps you review your logged time and money over the life of your recurring budget. Think of the activities feed as your personal assistant, reporting back to you all important user and budget activities. It feeds live updates on work-in-progress, from hours logged and budget status, to business-critical actions you should be aware of. Pro tip: Clicking on a user-related activity such as logged hours updates will redirect you to the user’s dashboard page where you can review their logged hours by Client and Project in more detail. While the Status tab gives you the big picture of a project, the Hours tab shows you the granular detail. It’s a chronological view of who’s been logging hours on a project. By default, you'll see all logged hours and money across the project's lifetime. You can customize your view by using the drop-down filters to select specific time frames or the activities for certain users and tags. You can also include planned hours or money in the drop-down furthest to the right. From the Hours tab, you can mark entries as "Billed" once they've been invoiced to your client. Simply check the boxes next to the relevant entries, click “Billed” and ‘Update’. Entries marked as "Billed" will now appear in green on the Hours page. If you made a mistake, simply follow the same steps to mark entries as ‘Unbilled’. This helps prevent users from editing logged time entries that have already been invoiced. Admins can override the entry lock function to entry already “Marked as Billed” by clicking “Make Changes” on the locked 🔒entry. Once you’ve selected your preferences, you can export your Hours report to a PDF or Excel file by hitting the down arrow icon to the right. This is helpful when you need to provide a client or team lead with a detailed entry log including notes and tags. Here you can quickly create and share reports detailing a project's progress, total logged hours, and project task or and phase breakdown. Everything can be shared via a URL link or exported to PDF or Excel files. The Hours Graph visualizes all logged project hours for a specific timeframe. You can instantly see where a project was most and least active, and where it began and finished. This gives you a visual overview of each user’s project contribution. Filter down to just one user or compare numbers for everyone involved in the project. Total logged hours appear in order of most to least logged hours, but you can reverse the order by hitting the arrow near ‘Total logged hours’. You can also see the total logged money based on the user’s hourly rate and total hours logged on the project. Tags help you understand how much time and money have been logged on a project phase, and gives you the insight you need to create better project proposals. If you know a particular project phase tends to take 50 hours, you can forecast a more accurate proposal for future projects. Fewer surprise costs and a happier client! You can monitor project phases using Tags and subtags, which can be created in the Settings page. The tags section gives a breakdown of each phase of a project. The project Reports tab shows an overview of the project data for active users only. 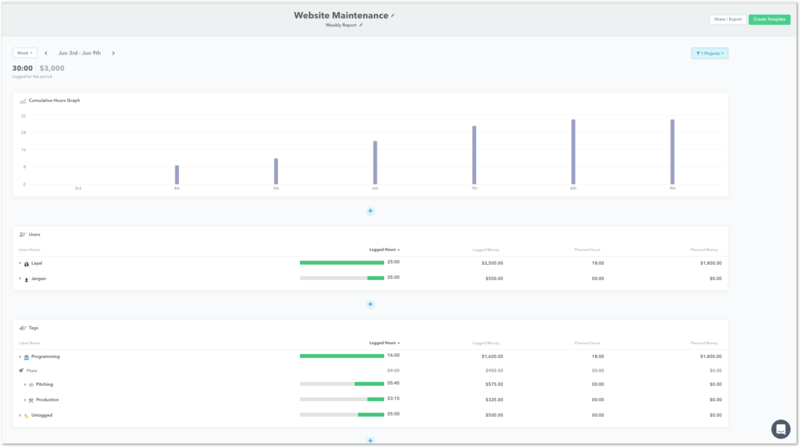 This includes the Hours Graph to give you a visual overview of logged hours, the data for each user assigned to the project, and a breakdown of tags (or phases) of the project. If you want to report on active and deleted users, or plan to generate a project report on a regular basis, you can create a saved report template to prevent you from duplicating effort. Just click on the quick action menu or “…” in the upper right-hand corner of the individual project page and choose ‘Open in Reports’. This will auto-populate the projects hours graph, users chart and tags chart, based on the time frame you’ve selected in the project's page.